Title: When Gods Have Joined Together! Synopsis: Thor flies to Olympia as Zuras and his fellow Eternals prepare to attack the Mothership of the Celestials in order to stave off the 50 Year Judgement that the Space Gods plan to render upon the Earth. Thor cannot lend his support to attack, stating that he does not believe that a direct confrontation is the best course of action. The Eternals commence the Ritual of the Uni-Mind and pool their strength in order to contend with the mighty Celestials. After the Eternals depart, Odin and Zeus arrive in Olympia with their combined forces with the goal of laying waste to the city of the Eternals and preventing their attack on the Celestials. 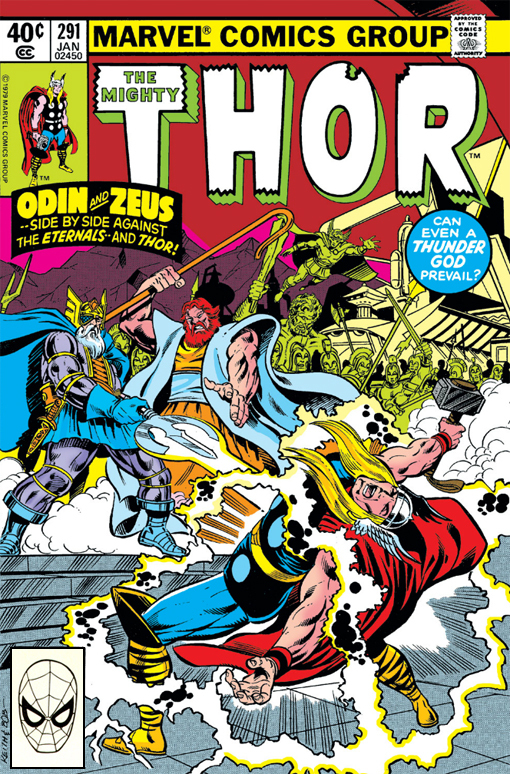 Thor fights to stop their attack, but Odin renders him helpless by turning him into Donald Blake. The Eternal then return and an epic battle ensues: Eternal vs. Immortal--Titan vs. Mutate--One brand of Olympian against another. Odin restores Donald Blake to his godly form in order to maintain a fair fight and the issue ends in suspense with the All Father's spear at Thor's throat.